The recent indignity by which the Obama administration wants to mandate everyone, including all Catholic institutions or their insurers, to pay for contraception, sterilization and abortion-inducing drugs, has raised the issue of Catholic teaching on these issues. Some commentators have mistakenly asserted that the Catholic ban on these practices only goes back to Humanae Vitae (On the Regulation of Birth), by Pope Paul VI in 1968, or as far back as Casti Connubii (Of Chaste Wedlock), by Pope Pius XI in 1931. The latter encyclical was written in response to the change of moral doctrine by the Anglican Church, which undermined centuries of Protestant condemnation of contraception by permitting it at the Aug. 15, 1930 Lambeth Conference. Paul VI wrote Humanae Vitae in response to the then newly invented birth control pill, rejecting it as a legitimate means of contraception for Catholics. However, these encyclicals, along with the 20th century’s nearly 100 other Vatican statements condemning artificial birth control, were simply restating the continuous history of moral theology on this topic. Catholics do well to know this history of moral teaching on contraception and abortion to back up our position against the mandate, as well as to know better how to live the Catholic faith. Therefore, we will present some of the texts from the patristic (early Christian) sources to demonstrate how early was the Christian rejection of these practices, known widely in the Greco-Roman world. 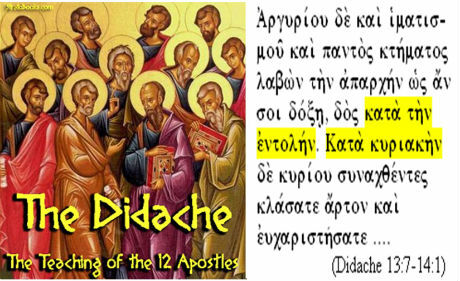 The earliest reference to contraception and abortion is in the Didache, a document from the second half of the first century or early second century. Didache reads: “You shall not practice birth control, you shall not murder a child by abortion, nor kill what is begotten” (2). Many translations read “practice sorcery” because the Greek word sometimes has that meaning (see Wisdom 12:4, Galatians 5:20, Revelation 18:23). However, it also means practice medicine or use poison, and the term may refer to contraceptive measures, as is the case in a number of the following texts. 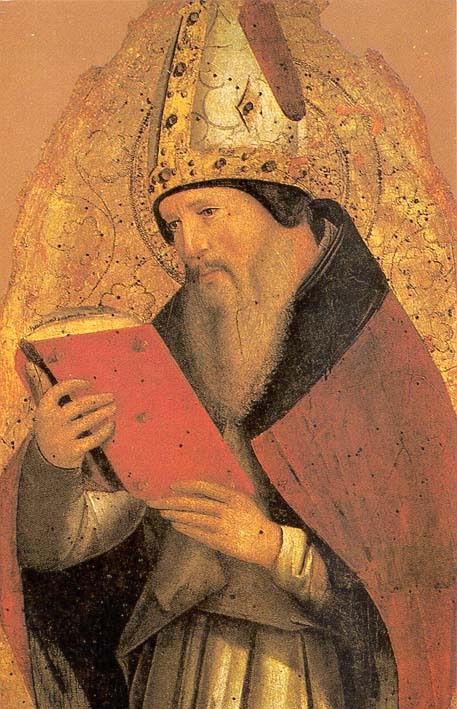 Another early text is the Epistle of Barnabas: “You shall not slay the child by procuring abortion, nor shall you destroy it after it is born” (19). This also shows that the earliest Christians forbade abortion. 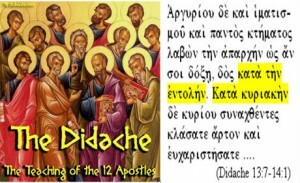 In the second century, St. Clement of Alexandria wrote in the Paedagogus (2.10.96): “Women who resort to some sort of deadly abortion drug kill not only the embryo, but along with it, all human kindness.” This passage supports our translation of the Didache by mentioning the use of drugs to induce abortion. In 177, Athenagoras of Athens wrote in the Supplication for the Christians: “And when we say that those women who use drugs to bring on abortion commit murder, and will have to give an account to God for the abortion, on what principle should we commit murder?” This is the first of many patristic texts identifying abortion with murder, thereby indicating a high value to the personhood of the fetus. Tertullian’s Apology in 197, while he was still in union with the Church, says, “In our case, murder being once for all forbidden, we may not destroy even the fetus in the womb, while as yet the human being derives blood from other parts of the body for its sustenance. To hinder a birth is merely a speedier man-killing; nor does it matter whether you take away a life that is born, or destroy one that is coming to the birth.” Tertullian was himself a married man and understood the dignity of the fetus in the womb. In the third century, Minucius Felix (226) wrote in Octavius: “There are some women who, by drinking medical preparations, extinguish the source of the future man in their very bowels, and thus commit a parricide before they bring forth” (30). Around 228, St. Hippolytus wrote about unmarried women, including some reputed to be Christians, who became pregnant from illicit relationships. In his Refutation of All Heresies, he says, “Whence women, reputed believers, began to resort to drugs for producing sterility and to gird themselves round, so to expel what was being conceived on account of their not wishing to have a child either by a slave or by any paltry fellow, for the sake of their family and excessive wealth. Behold, into how great impiety that lawless one has proceeded by inculcating adultery and murder at the same time! And withal, after such audacious acts, they, lost to all shame, attempt to call themselves a Catholic Church” (9.7). He considers their behavior an effectual refutation of their status as Christians. A document known as the Constitutions of the Holy Apostles reads “You shall not slay thy child by causing abortion, nor kill that which is begotten; for ‘everything that is shaped and has received a soul from God, if it be slain, shall be avenged, as being unjustly destroyed’” (7.1). This states the belief that the fetus has a soul and its life must be protected from conception forward. In the fourth century, the Latin and Greek authors addressed these issues. St. Augustine wrote On Marriage and Concupiscence (419). Though he was already the bishop of Hippo when he wrote it, he is equally famous for having lived with a concubine for 14 years and had a son with her. Therefore, he had an experience of living in a sort of family and he learned from his mistakes. He wrote: “I am supposing, then, although you are not lying [with your wife] for the sake of procreating offspring, you are not for the sake of lust obstructing their procreation by an evil prayer or an evil deed. Those who do this, although they are called husband and wife, are not; nor do they retain any reality of marriage, but with a respectable name cover a shame” (1.15.17). St. Basil the Great wrote in his First Canonical Letter, Canon 2: “The woman who purposely destroys her unborn child is guilty of murder. With us there is no nice enquiry as to its being formed or unformed. In this case it is not only the being about to be born who is vindicated, but the woman in her attack upon herself; because in most cases women who make such attempts die. The destruction of the embryo is an additional crime, a second murder, at all events, if we regard it as done with intent” (374). The reason he mentioned the “nice enquiry as to its being formed or unformed” is that some theologians thought that the rational soul did not develop in the fetus until the third month or even later. St. Basil simply notes that this is not an issue because at any stage the destruction of the embryo is a “crime” and a “murder.” Pace Nancy Pelosi, who had claimed that since St. Augustine had thought that the rational soul began late in the pregnancy, therefore abortion would be acceptable in the early stages. St. Basil shows that such false reasoning was unfounded. St. Jerome, Letter 22 to Eustochium (396), said: “Some, when they find themselves with child through their sin, use drugs to procure abortion, and when (as often happens) they die with their offspring, they enter the lower world, laden with the guilt not only of adultery against Christ, but also of suicide and child murder. Yet it is these who say: ‘Unto the pure all things are pure; my conscience is sufficient guide for me.’ A pure heart is what God looks for” (13). Here St. Jerome denies that the conscience of the abortion is a sufficient guide. As will be clarified in later centuries, the conscience must be correctly formed so that the Lord can truly find a pure heart in the individual. None of the Fathers or councils offer contradictory opinions on contraception or abortion. Popes Pius XI, Paul VI and Blessed John Paul II were simply presenting the teaching of the Church in the same line of thought that began in the earliest generations, continued through the Middle Ages, and was taught by the Protestant reformers. (Martin Luther called people who use contraception “logs,” “stock” and “swine.” John Calvin said contraception was “condemned and “doubly monstrous,” while abortion was “a crime incapable of expiation.”) The popes have called the Church to a moral and holy approach to marriage and the conception of children. We form our conscience in the light of this constant tradition, and we teach and live it by the graces God gives us. On this basis we insist that the government allow us complete freedom to practice our religion and its precepts.